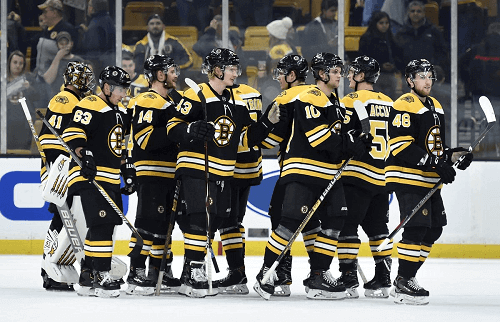 One of the original six teams in the National Hockey League (NHL), the Boston Bruins have a long history in the hockey industry. The Bruins are members of the Atlantic Division of the Eastern Conference of the NHL. Their current coach is Bruce Cassidy and the Bruins’ home arena is at the TD Gardens. Read on for more on the Boston Bruins hockey team. The team was founded in 1924, and are the NHL’s third oldest team and oldest hockey team in America. Also, it’s a part of the Original Six franchise with the Chicago Blackhawks, Detroit Red Wings, Montreal Canadiens, Toronto Maple Leafs, and the New York Rangers. The Bruins’ first home arena, the Boston Arena (now known as the Matthews Arena) is the world’s oldest indoor ice hockey ring. It was built in 1909-10. The uniform of the Boston Bruins is black, gold, and white. While their mascot is Blades the Bruin, a brown bear in a black-and-white-striped Boston Bruin jersey. The also have an intro song and a goal song. Currently, the Bruins enter the ice to the song “Cochise” by Audioslave and “Joker and the Thief” by Wolfmother is also played before the opening faceoff. After every win at the TD Gardens, they play “Dirty Waters” by The Standells. In December, they play The Ventures’ instrumental rock version of “The Nutcracker” overture known as “Nutty”. It’s become a traditional song associated with the Boston Bruins. After the Boston Bruins scored a goal on home ice, “Kernkraft 400 (Sport Chant Stadium Remix)” by Zombie Nation plays. From 1970 until 1995, they played “Nutty” as their goal song. From 1995 to 1999 they used the organ version of “Paree: by John Kiley and “Rock and Roll Part 2”. Then, from 1999 to 2006, “Song 2” by Blur was their goal song. The Bruins have had six Stanley Cup victories since the team was established. These happened in 1928, 1938, 1940, 1969, 1971, and 2010. They’ve also won the Presidents’ Trophy twice in 1989 and 2013. Furthermore, they’ve dominated the Prince of Wales tournaments, taking home the trophy in 1927, 1928, 1929, 1930, 1932, 1934, 1937, 1938, 1939, 1940, 1970, 1971, 1973, 1987, 1989, 2010, and 2012. Members of the Boston Bruins over the years have won trophies including the King Clancy Memorial Trophy, Lester Patrick Trophy, and Conn Smythe Trophy among many others. While the Boston Bruins may only have six Stanley Cups to their name, they’ve been a consistently competitive team in the NHL. Concurrently, its featured among the top teams in the Eastern Conference. Also, they are a good team for hockey bettors to go for, given they historic and competitive performances. There’s a good mix of young and veteran players, giving them strong potential. The Boston Bruins aren’t ones to be ruled out just yet.